5 years & 600 posts! First off, Happy New Year! I hope all of you have had a great holiday season and an excellent start to 2013. As far as resolutions go, I haven’t made that many – it’s better to keep the list short and attainable – but one resolution I have for this site is actually to make fewer resolutions. First of all: Daredevil (i.e. the main title). I guess that goes without saying, but I’m really excited about what’s happening right now and where the story might be heading. The Matt vs. Foggy dynamic is interesting and I expect to see some great character development coming out of this conflict. Then there’s the Milla mystery, the issue of who has been pulling Daredevil’s strings, and all of Matt’s unresolved personal issues. 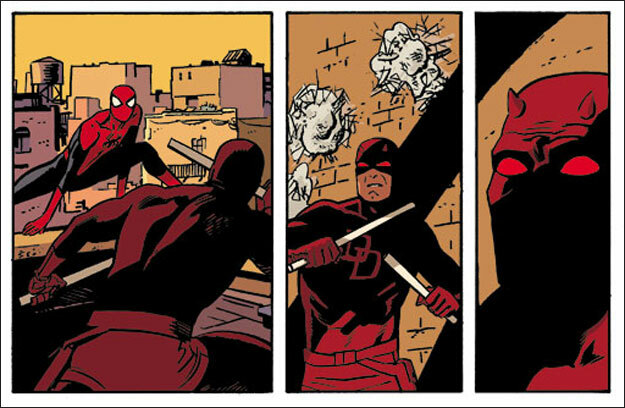 And, given that we’re about to be reunited with Stilt-Man in Daredevil #22 (see panels from the preview below), I can’t wait to see what new and old villains Waid, Samnee and the rest of the team will line up for Daredevil in the following issues. Secondly, as of Daredevil: End of Days #4 (which came out yesterday), I finally find myself genuinely intrigued by where that series is going. We’ll have a final resolution to the story by the time the eight and final issue comes out later this spring. Another thing to look forward to is a project I’ve actually been involved in. It’s an anthology published by Sequart and edited by Ryan K Lindsay called The Devil is in the Details: Examining Matt Murdock and Daredevil. I wrote the chapter on Foggy for this book, but am really looking forward to reading the other chapters. Check out the details here and keep your eyes peeled for this one! Well, that’s it for now! What are you hoping for in 2013, Daredevil-related or otherwise? I wouldn’t miss this book for the word. Congrats on your annyversary and book chapter. No one knows Foggy like you do. The book looks awesome – I can’t wait to read it! I’m looking forward to a 2013 full of Daredevil-ly goodness and getting my hands on whatever I can; this looks perfect! Thanks, guys! I hope I will have done Foggy justice. It was great fun (though very time-consuming!) working my way through every issue of Daredevil from his perspective. I can’t wait to read this book! Congrats on the work. All of it. The book and the site. Should be a great year for DD fans. What do I hope for? Well, DD-related, I’d love another Artist Edition. Maybe a Miller one, but I’m easy to please for anything DD in this size. Congrats Christine, and I’m really excited about the book! I’d never heard of Sequart before so now I have a new comics site to read – I learn so much reading this blog. Christine, thanks for mentioning the book. Everyone else, rest assured, Christine absolutely nailed it on her Foggy essay , it’s so good. I hope you all get a chance to check the book out. As a massive daredevil fan, it’s everything I have always wanted. I’ve read the book a fair few times already and I’m constantly engrossed by it.